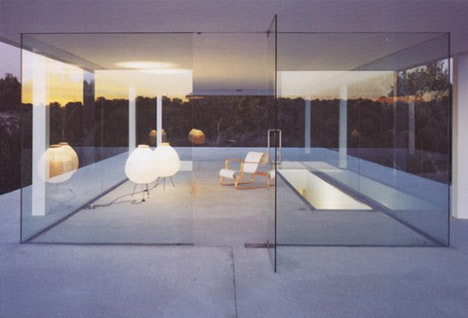 There are few design concepts more widely integrated in modern architecture than the idea of openness. When architects work with open designs, they not only allow the residents more flexibility in their living space, they also create homes that feel more spacious and luxurious than their tightly closed-in counterparts. 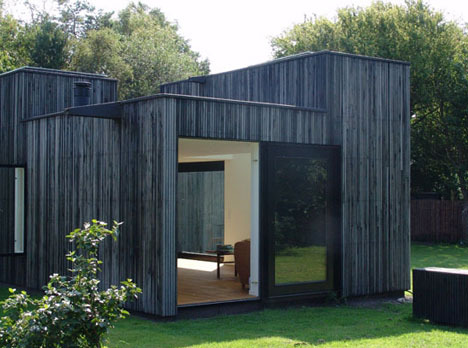 This stunningly simple house by Primus Arkitekter of Denmark consists of a few interlocking boxes adorned with weathered wood on the exterior and plain white paint on the interior. The wooden outer walls provide a perfect contrast to the simple, modern interiors -a counterpoint which makes the small home seem far larger than it actually is. By combining cool concrete and warm wood, this cozy cabin by BAK Architects is ready to comfort residents all year long. Stairs, cabinets and furniture all seamlessly blend into the greater overall design, seeming to flow gently from the walls themselves. The use of seamed concrete meshes amicably with the grainy wooden slats and hints at stretching expanses of space that may just go on forever. 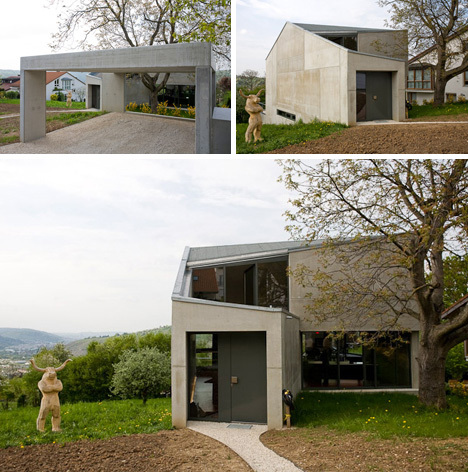 Like BAK Architects, designers at Architects Brauning understand that concrete doesn’t have to be a cold, unwelcoming material. Hard steel, brushed concrete and glass walls give this house a distinctively industrial feel, but the open interior, adorned with bright orange flooring and stacks of logs, gives it a warm, welcoming atmosphere –one heavy in contrasts. 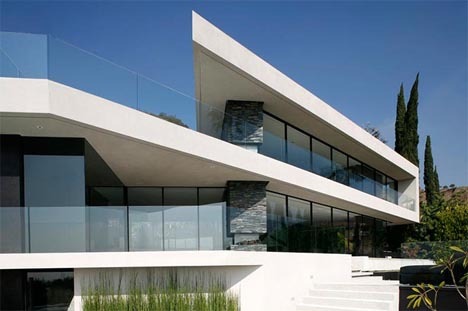 The sharp lines and inspired contrasts make the house distinctively modern, but still cozy enough to be called home. 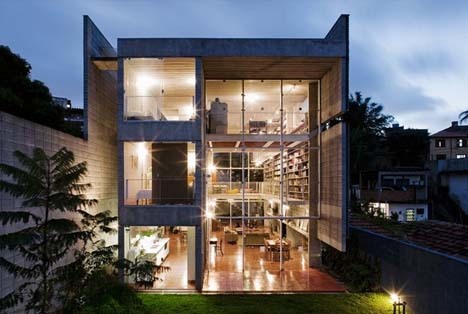 It’s hard to create a room more open to the outside world than the glass-framed living space sitting atop this concrete home. Perhaps that’s why Alberto Baeza decided to counterbalance this highly visible upper level with the secure, private concrete bunker below. This concrete and glass masterpiece is a perfect setting for anyone who enjoys a great view but still wants to have plenty of privacy as they participate in their normal, day to day activities. Architect Max Pritchard had quite a challenge ahead of him when presented with this stunning setting for a new home. How could he possibly build something that would allow the owners to enjoy the gently flowing stream, ancient red gum trees and rocky slopes of their property without disturbing any of the natural beauty? 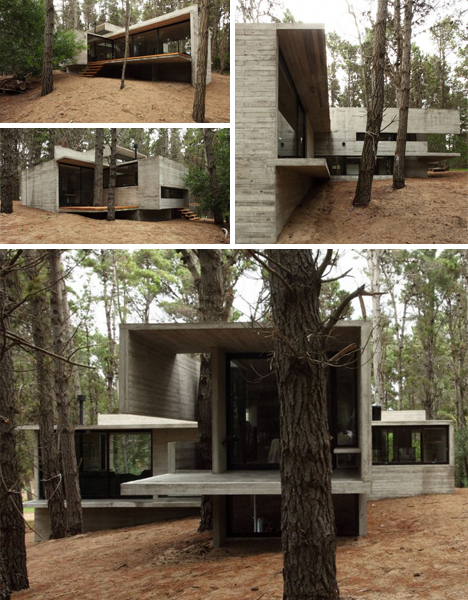 His solution was an industrial-looking house on stilts that somehow manages to look perfectly in place with the serene setting. By gently nestling the home inside the small canyon, Pritchard was able to minimize its visibility from a distance. 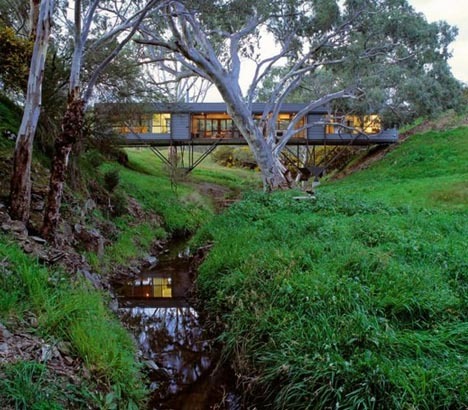 As you close in on the home, the simple and boxy design, covered in recycled metal, makes the structure almost appear like an abandoned railroad bridge, ensuring it still seems perfectly at ease in its setting. The slopping, rust-colored roofs of this dramatic desert home bring to mind images of antique barns of the Old West, but upon closer inspection, this design by Rick Joy is one hundred percent modern. 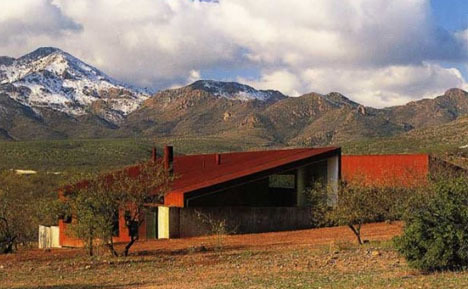 Inside the rusted roof and rammed-earth walls are walls made entirely of glass, allowing residents to take in the picturesque views of snow-capped mountains. An edgeless pool is ready to help visitors cool down after a hike across the stunning desert landscape. 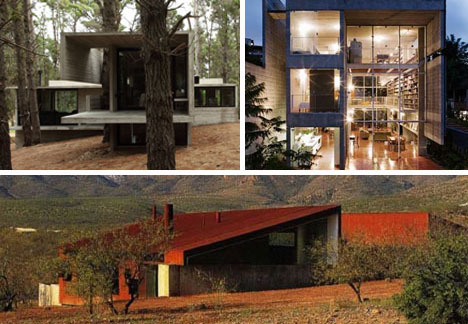 As much as the home fits in with its surroundings, it also serves as an ideal escape from the area’s harsh realities. 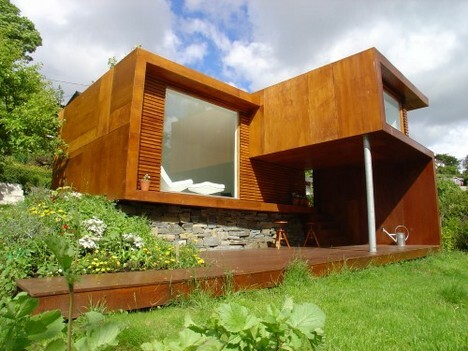 The pure simplicity of this tiny summer home is exactly what makes the design by Tommie Wilhelmsen so brilliant. By taking advantage of small nooks and crannies, he ensures there is adequate living spaces without isolating and cramping any areas of the small building. While many people would find the house a little too small for year-round enjoyment, it is precisely this quality that makes it such a welcome, comforting summer home –inviting residents to leave their worries, and extra possessions, elsewhere. Architects Angelo Bucci and Alvaro Puntoni took advantage of the severe drop off of this piece of property to create a refreshingly unique combination live-work space. Much of the house is hidden away below street level, giving the residents ample privacy. At the same time, the open heart of the design allows in ample light and fresh air, preventing any sense of isolation or stuffiness. One of the most distinct features of the design though is the massive, lofted office space hovering above the rest of the home and accessible only through a metal staircase. This concept is not only attractive, but it also helps keep a distinct separation between the home and office space, helping residents keep a strong distinction between their work and home life. Like the lofted home above, this Hollywood home takes full advantage of challenging natural topography. Designers at Xten Architecture used retaining walls and a massive hillside to create a private inner space that is still provided with natural light and air. On the other side of the building, the house juts out from the mountainside, offering unbelievable views of the city below with its floor-to-ceiling window walls. Anyone with an affinity for books will instantly appreciate this architectural marvel devoted to literary extravagance. Architects at grupoSP designed this open-plan library home for some true book lovers who own enough books to fill three floors worth of shelves. Of course, the bookshelves aren’t the only interesting part of this floor plan. 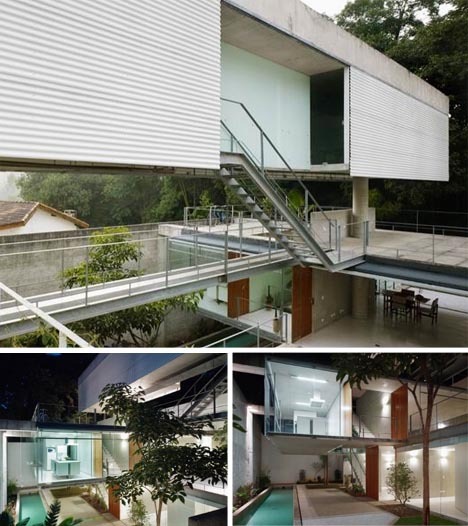 Floating metal mesh walkways, two full walls of windows and frequent gaps in the concrete walls allow ample mobility and privacy in the home while still taking full advantage of natural light.